The aircraft took off from Cúcuta-Camilo Daza Airport in Colombia for a domestic flight to El Yopal. On board were three crew members and five passengers. The cargo consisted of two loads totalling 2500 kgs. The crew filed a VFR flight plan with a cruising altitude of 11500 feet. The DC-3C took off at 15:33 hours local time. Last radio contact was at 16:05. The aircraft failed to arrive at El Yopal and a search mission was launched. The aircraft remained missing for 23 days. Finally, on April 12, 1999, the aircraft was located on the Radial 287 from Tame Airport, at 24.2 nautical miles. The wreckage distribution and the evidence of the intact vegetation around the aircraft indicated that a significant vertical speed and very little forward speed. Apparently the crew lost control of the aircraft due to extreme turbulence and wind gusts. 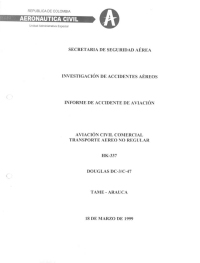 Possible loss of control of the aircraft due to the presence of strong air currents or wind shear, accompanied by extreme turbulence that caused it to hit the ground. Inadequate planning of the en-route flight, overflying the mountain range apparently with the purpose of performing the operation in less time. Distance from Cúcuta-Camilo Daza Airport to El Yopal Airport as the crow flies is 289 km (181 miles).